After you send a document out for review, you might get a lot of copies back—with suggestions and revisions you don’t want to miss. When that happens, combine all those edits and ideas into one document. If you are not sharing your documents with others, you can combine documents by copying and pasting. Click Review > Compare > Combine. 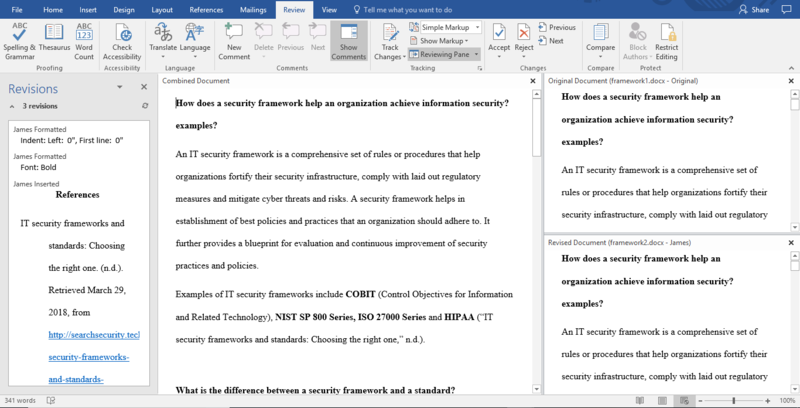 A pop-up window﻿ lets you choose ﻿the Original document and the Revised document. Under Original document, click the down arrow and choose the document you sent for review. If you need to browse to the file's location, click the folder icon. Remember, this is the original document that you worked on without any changes or modifications. Under Revised document, choose the document you want to merge. In the Label unmarked changes with box, type a name or phrase so you’ll know who suggested the changes. 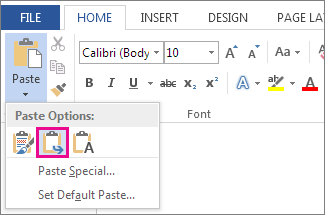 Click More to get more options for combining the documents﻿. Under Show changes in, click New document. 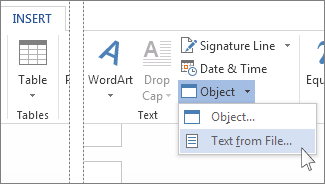 Word opens a new document that combines the original document and the copy you merged in. The screen is divided into three sections. 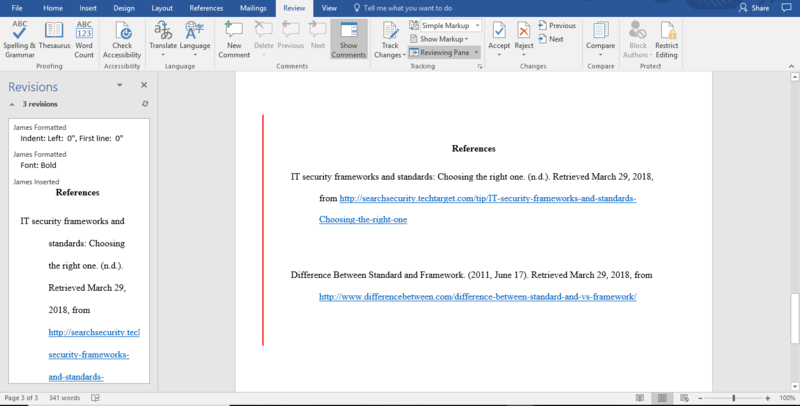 One section shows the Revisions made, the middle section﻿ shows the combined document, and the third section,which is split in two, displays the Original document and Revised document. If that’s too much information on the screen, click Compare > Show Source Documents > Hide Source Documents. Note the red vertical line that shows where changes were made. 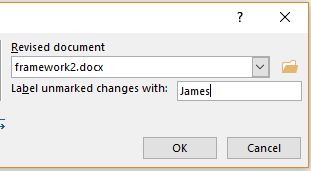 When you've resolved the combined changes the way you want, save the document. Tip: Next time, skip all of this by sharing the document on OneDrive and inviting people to add their edits and comments. If you want to merge in more copies, save the document that contains the combined changes of the first two copies. Then merge the additional copies into that document. 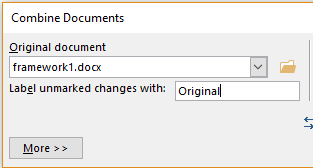 Under Original document, click the arrow and then click the document that contains the combined changes. Under Revised document, click the next copy you want to merge in. Under Show changes in, click Original document. If you want to combine multiple documents and make a single file, you can copy and paste all the documents’ contents into one file. Or you can open the first document, click Insert > Object > Text from File, and then browse to the documents you want to add, click them, and then click Insert. 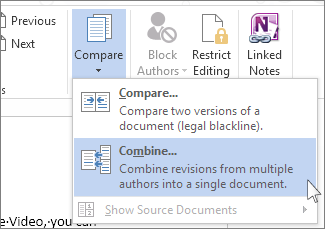 To merge two different documents into one file, copy the contents of one document and paste it into the other. In the document you want to add, choose Home > Select > Select All to select the whole document. Or press Ctrl+A. Choose Home > Copy. Or press Ctrl+C. 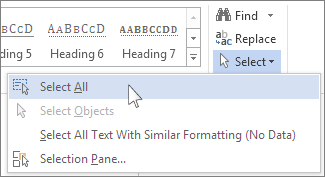 In the second document, click where you want to add the copied content and choose Home > Paste > Merge Formatting to make the new content match what’s already there. Alternatively, you can press Ctrl+V to paste and select Merge Formatting in the paste button that appears below.